The Leave No One Behind Conversations is a workshop series designed to start a conversation about the 2030 Agenda's LNOB promise and to empower marginalised groups to actively contribute to this conversation by valuing their knowledge of social exclusion issues, based on lived experience. Work began in March 2018 with the design of an information leaflet and a promotional video. We invited members of groups from drug recovery programs, community development projects, members of the Roma and Traveller communities, migrants, as well as development experts, to participate in the Leave No One Behind Conversations. Workshops began after a public launch of the initiative, with an address by project patron David Donoghue (Co-facilitator of the 2030 Agenda and former Irish ambassador to the UN), at the Sustainable Ireland Conference in April 2018. 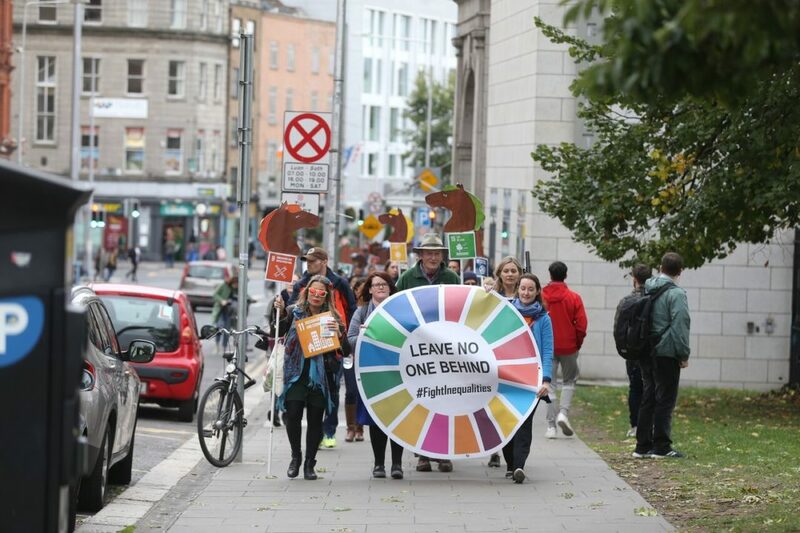 In Ireland, participation of marginalised groups in SDG discourse is limited. The State runs SDG Stakeholder Forums, public consultations requiring online registration and conference attendance. This can be inconvenient and intimidating for people from marginalised communities who have no experience of such events. As a result, the interests and perspectives of disadvantaged groups are under-represented in discussions at the Forum. With the Leave No One Behind Conversations, we committed to meeting groups in their own spaces, when it suited them. Participants’ trust was gained by listening, offering encouragement and emphasising the value of their knowledge and experience. We went on to host a summit and produce a Working Paper involving both marginalised groups and development experts. By treating workshop participants as experts in social exclusion issues and including them in discussions on political decisions affecting them, we have empowered these communities so that in the future, they actively participate and contribute to similar discussions and everyone may benefit from their insights and experience. Over 110 people participated in 15 workshops. 50 people attended the Leave No One Behind Summit. Participants were receptive to the objective of the workshops, eager to speak about how policies impact them and were empowered by seeing that their knowledge and experience holds weight and is valued. Some found the process so empowering that they gained the confidence to speak publicly at the Summit and hopefully, in similar settings in the future. Additionally, project funders Concern Worldwide were enthused by the participant feedback and the Working Paper, expressing an appetite for a second round of workshops . A government representative attended the Summit and invited Leave No One Behind participants to the State-run SDG Stakeholder Forum, demonstrating that this kind of a dialogue can facilitate partnerships between those that are left behind and those with the power to affect policy. After receiving one copy, the office of the President of Ireland, Michael D. Higgins, requested 6 further copies of the Working Paper, another indicator of the quality of the work and of the success of the project. A partnership has been established between the government department responsible for SDG implementation (Department for Communications, Climate Action and Environment) and ATD Ireland. ATD presented the Leave No One Behind Conversations at the most recent SDG Stakeholder Forum once again bringing the lack of diversity in Forum attendees, and in voices in SDG discourse in general, to the attention of all present. The spirit of 'leave no one behind' and 'reaching the furthest behind first' can be incorporated into many initiatives. Think about how your project can reach beyond the obvious, immediate stakeholders and work to include a more diverse participation. The ultimate objective of the Leave No One Behind workshops is to break away from the status quo and secure participation of those who are unlikely to have been involved in meaningful discussion social exclusion, despite being disproportionately affected it as an issue but the same principals of encouraging diverse participation, representing the interests of all members of society can be applied in almost any project discussing social issues. Consider the challenges that reaching socially excluded groups may present. What barriers might have impeded people's participation until now? What can you do to best accommodate them and ensure their participation for maximum results? Accommodation is not solely logistical and does not simply imply working around their timetable. It can involve overcoming social barriers and time may need to be dedicated to building a trusting relationship with participants before a positive, participative workshop can take place. It is worth asking in advance if groups have prior knowledge of the SDGs. With most groups you can assume no prior knowledge so it is important to dedicate sufficient workshop time to briefly introduce the 2030 Agenda. Be prepared to adapt this for the level of knowledge of different groups. Finally, and somewhat evidently, when facilitating a workshop, without forcing participation from anyone, try to ensure that everyone gets the opportunity to speak and is made to feel comfortable expressing themselves.